It’s been more than a week since we entered 2019. And for most of us, that means we’re still working on our New Year’s resolutions—or forgot what they were in the first place. Every January, our searches for resolutions spike around the world. We proclaim our best intentions for the new year, but it’s tough to keep promises to ourselves. By the end of the year, most of us are 20 percent less interested in picking up the weights, 30 percent more likely to hit snooze on getting proper sleep and 50% less interested in sticking to a diet. We all feel it. The struggle is real. Let’s make 2019 different. Google is here to give your resolutions a boost, with tools and tricks that will help you form good habits to get fit, sleep better, practice digital well-being and live mindfully. Let’s start with some of the most popular resolutions every year: getting fit and eating better. 1. Set your goals in Google Calendar. First up, set some realistic goals for yourself and make yourself accountable by blocking time in your calendar. Goals in Google Calendar automatically finds time in your busy schedule to go for a run, or prep some healthy meals for the week. If an important clash comes up, no worries: Google Calendar will suggest a better time for you. 2. Track your workouts and earn points with Google Fit. 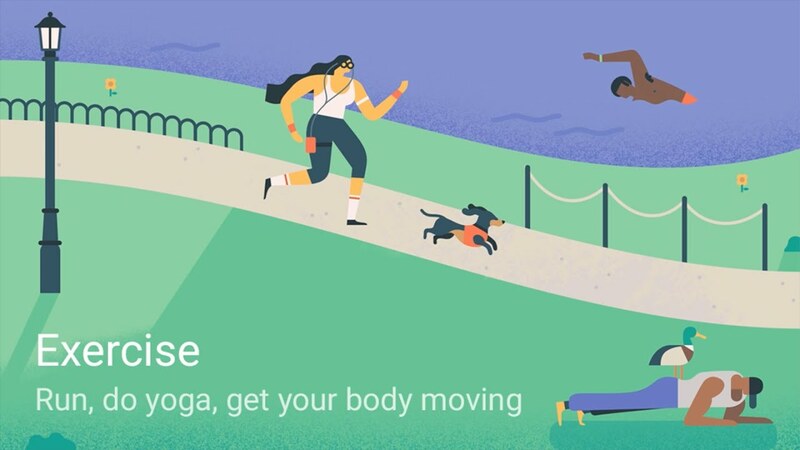 From swimming to gym workouts, Google Fit works with many of your favorite apps and health devices to give you credit for all your moves. Use Google Fit on your Android phone to earn Heart Points and track how you’re progressing towards meeting your goals. 3. Blaze new trails on your bike with Google Maps. Check out the bike paths in San Francisco’s Golden Gate Park. For the two-wheel enthusiasts out there, you can find biking routes near you by turning on the cycling layer in Google Maps. Dark green lines on the map show dedicated bike trails and paths without cars, green lines show streets with dedicated bike lanes and dashed green lines show other streets recommended for cycling. 4. Stick to your diet goals with Google and YouTube. If your resolution is to count calories as part of your diet, Google makes it easy. If you’re in the mood for French fries at lunch, just search “how many calories in French fries” and you’ll get your answer — 312 calories, plus 23 percent of your daily recommended daily intake of fat. You can also turn to YouTube to learn how to make healthy recipes. Thanks to YouTube creators like Veggie Recipe House, The Serious Fitness, and Health Nut Nutrition, you can create nutritious and delicious dishes all year long. 5. Follow along with the #GetFitWithGoogle challenge. To get you motivated, we’ve invited people from around the globe to show us how it’s done in the #GetFitWithGoogle global challenge. From January 1-28, teams of four influencers per country are competing against each other to earn as many Heart Points as possible during the month with Google Fit. Here’s the global leaderboard after Week 1. Get to know the teams! Follow their progress with the #GetFitWithGoogle hashtag on Instagram, and see who’s taking part in the challenge around the world. Don’t forget to share your fitness progress using the hashtag and let others know how you #GetFitWithGoogle, too.